He always knew the right things to say to turn my tears to laughter. He was the one I went to when I wanted to unburden my often burdened mind. He teased me, said I took life too seriously, and called me an old woman in a young girl’s body. He taught me how to ride a bike and kick a football. It was him I clung to on my first day at school while my mother looked on helplessly. Daddy’s girl, that’s what she called me. Everyone thought I would grow out of but they were wrong. The older I grew, the more attached I became to him, and he to me. When mummy suggested I go to an all boarding high school, he was furious. I burst into tears, begging him not to send me away and he held me close and said he would never let anyone separate us. My friends didn’t understand why I loved my Daddy so much, they were happier when their fathers were out of the house. Only Daddy and I understood the bond we shared. Mummy is manic depressive. They say she couldn’t bear to look at me after I was born and the first time she touched me was when I turned one and daddy made her hold me to pose for a picture. Changing diapers, midnight feeds, rocking me to sleep…daddy did it all. When I was a little girl I would cry all the time, asking daddy why mummy didn’t love me and he would tell me that she did but because of her illness, didn’t know how to show it. He loved me so completely and showed me so much affection that he became enough for me. He became my world and I, his. I had become used to silence in the house, save for daddy and I’s occasional giggles, so I found the loud arguments distressing. Overnight, mummy became a different person; confrontational where she was once cowardly, aggressive where she was once docile. Whenever I tried to talk to Daddy about it he would smile vacantly, give me a hug and tell me everything would be alright. He’d never given me reason to doubt him so I took his word for it. Weeks turned to months, still it carried on and still he assured me things would be fine. Many nights I cried myself to sleep, praying that the old mummy would return and things would be as they once were. Daddy’s smiles no longer reached his eyes and his clothes now hung from his once stocky frame. On the morning of my sixteenth birthday I woke up to find Daddy sitting at the foot of my bed. He smiled at me and I lunged into his arms. It was the first genuine smile I’d seen on his face in months. He carried me down to the breakfast room where I found a plate of pancakes, bacon and sausages waiting for me. He gave me an hour to eat and get myself ready to go out. I asked if mummy was coming too and he said she wasn’t. We went shopping for a new dress as he said we were going out to dinner that night. He took me to the salon to get my hair and nails done and then to an ice-cream bar for dessert. I begged him to tell me where we were going to dinner but he said it was a surprise. As soon as we got home, I rushed up to my room to get ready. I loved my new dress! It was a shimmery gold knee length fitted dress with a plunging neckline. Daddy let me have it because I promised to wear a camisole under it so I turned out my drawers looking for my black vest. I couldn’t believe how beautiful the dress was and all dressed up, I ran into mummy’s room to show it to her. She was lying in bed with her back to the door and didn’t turn around to look at me. She pulled the blanket over her head. My heart shattered, landing like shards of glass around my feet. Silently, I shut the door and made my way downstairs to meet Daddy. That was the mummy I knew, the mummy I’d prayed would return, but still, I couldn’t help but be hurt. As soon as he looked at me, he knew something was wrong. He held me and I broke down in tears. I told him what happened and his eyes glazed over. I’d never seen him look that way before. Dragging me up the stairs, he kicked her door open. The new mummy returned and this time, the screaming reached unprecedented volumes and went on for hours. I tried in vain to calm them both down and when I couldn’t stand it anymore, returned to my room, crawled under my duvet and cried myself to sleep. As soon as I woke up the following morning, I went hunting for Daddy, I needed to check that he was okay. I walked into his room to find his bed made. That was unusual, I usually made his bed. There was an envelope sitting on his pillow and curious I inched closer to see what it was. It had my name on it. I recognised the hand writing, it was daddy’s. Tearing it open, I pulled out a single sheet of paper. It didn’t make sense at first. Why would he leave me a note? I looked around the room, confused and it was then I noticed the open doors revealing his empty wardrobe. I looked up and the suitcases that once lay gathering dust at the top of his wardrobe were gone. I pulled open the drawers of his bedside table where he kept important documents, empty. I raced down the stairs, out of the house and into the garage where he parked his car. It too was empty. I stood in shock as reality sank in. He was gone. Why?? Why??v? Why did Daddy leave? What was wrong with Mummy? Why was she lying in the bed like that? Suspense series or trust series eh?? Waila?? Heartbreak toh badT! 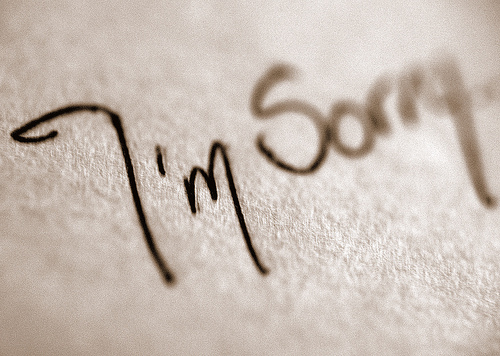 Sometimes, saying “I’m sorry” isn’t enough! Manic depressive? How long though? Will there be a concluding part? A happy re-union?? oh my, why did Daddy leave?? Why wouldn’t mum love her daughter? I beg please post the next one kia kia o!! Wow…i felt her pain. Even the ones we trust the most will let us down. I can’t wait for the sequel…Waila please dont keep us waiting 🙂 . I would like to hear the Father’s excuse. This is based on a true life story and that’s why it hit me hard. it’s such a hard thing to deal with…the only parent who was THE stronghold leaving. I could also feel her pain because I consider myself a daddy’s girl. Now that my heart is beating faster, I await the next one in the series. This is excellent writing! Very moving. Kept me in a tight grimace till the very last word. You sequel hunters are messing with my plans. I didn’t intend to write a sequel to this but I’m considering it. I’ll keep you posted.